Count's Kustoms, a one of a kind hot rod and chopper customization/ restoration shop located in the heart of Las Vegas and owned by Danny “Count” Koker. Metal on metal, mild to wild, the Count’s Kustoms’ team puts great pride and care into every one of our projects, no matter how big or small. Using only the highest grade parts available, we customize our vehicles to fit the particular tastes and desires of each individual customer. We are your one-stop shop for in-house paint, upholstery, frame-up builds and service. Our custom hot rods and choppers exceed expectation with creativity and die-hard quality, not to mention incredible handling and ride-ability. With razor-sharp attention to detail, from the bodywork to the final paint fit and finish, every custom embodies individuality and forward thinking, with a nod to the retro. 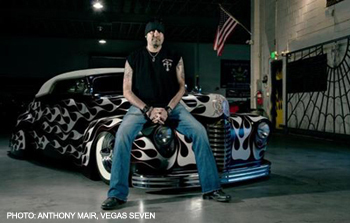 Danny Koker, the owner of Count’s Kustoms, is the creative force behind each project leaving his shop. Danny splits his pastimes between his love of all things automotive and his passion for music. 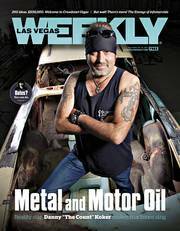 Danny "The Count" Koker on new History Channel Show "Counting Cars"